My watch has a steel strap and a black face, with orange elements. There is nothing special about it but, for some reason, I can’t leave the apartment without it. It was a gift from my father. He didn’t give it to me for any particular reason, but I suppose it has some value due to the fact that he wore it for many years. 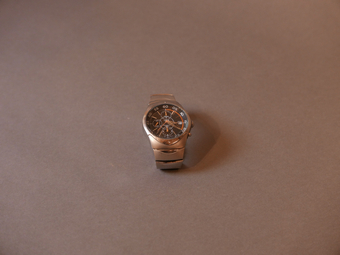 He gave it to me when I was 17 so, for a teenager, it was a first 'serious' watch. Since then I have bought, and been presented with, a couple of watches but I still return to this one. This project made me reflect on it; it’s not only a habit [to wear the watch] but also a piece of family memorabilia travelling with me through life. Hopefully I’ll pass it on to someone as well. There is no direct connection to my watch, but a Picasso exhibition that I attended many, many years ago was my first experience of art. It was a family trip to Gdansk (Danzig) in Poland. I don’t know if my father wore the watch, though.